Khodorkovsky’s defense confirms application for parole | Russian Legal Information Agency (RAPSI). MOSCOW, May 31 - RAPSI. Yury Schmidt, defense counsel of former YUKOS CEO Mikhail Khodorkovsky, has acknowledged filing a parole application for his client with the Preobrazhensky District Court in Moscow. Schmidt said that the application was based on the fact that Khodorkovsky has already served more than half of his sentence and has not had any disciplinary violations over that period. 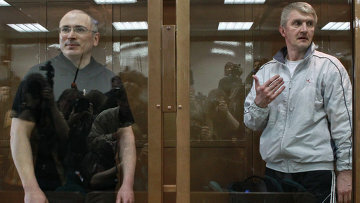 “These two facts are sufficient for the court to grant parole,” stressed Schmidt, while adding that the same applies to Khodorkovsky’s business partner, Platon Lebedev. Lebedev’s counsel, Elena Lisher, told the Russian Legal information Agency (RAPSI) that applying for parole does not equate with pleading guilty. In 2005, at their first trial, Khodorkovsky and Lebedev were convicted of seven criminal offenses, and sentenced to eight years in prison. In December of 2010, both were sentenced to 14 years of imprisonment for embezzling 200 million tons of oil and laundering the proceeds. Taking into account the time they served for their first sentence, the two were supposed to be released in 2017. On May 24, however, the Moscow City Court decreased their sentence by one year. 09:59 31/05/2011 Yury Schmidt, defense counsel of former YUKOS CEO Mikhail Khodorkovsky, has acknowledged filing a parole application for his client with the Preobrazhensky District Court in Moscow.